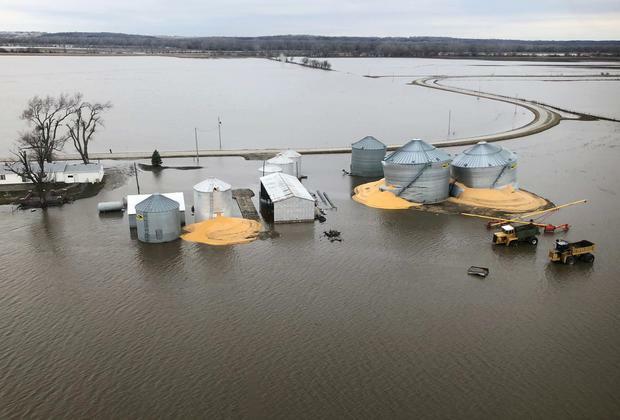 U.S. farmers, who have spent the last month sifting through damage left by a storm that flooded more than a million acres of crop land, now face a blizzard ahead of planting season. The storm hit the U.S. Rockies on Wednesday and was forecast to move eastward, threatening to bring as much as 30 inches of snow to western Minnesota and southeast South Dakota and another round of flooding to the Plains states. Frenzen, who grows corn, soybeans and wheat and raises cattle, said about a sixth of his acreage was devastated by the floods in March. Even after the waters receded, his land was strewn with sand, silt and other debris that he estimated would cost $500 to $600 an acre to get back into production. The latest storm would delay planting on his remaining acres and threaten some of the cattle, particularly young calves and pregnant cows. The herd must be constantly monitored throughout the storm to ensure that animals do not suffocate in the snow. “It’s no sleep,” said Frenzen, who was setting up wind breaks on his operations as protection from hypothermia. The storm will hit just as many farmers are making their final preparations to begin planting. Growers were hoping to get an early start this year as a rainy fall limited the amount of field work they could do after harvest, but the weather has not cooperated. Spring delays threaten productivity at a time when the farm economy is already under severe stress and growers’ profits are falling due to the trade war with China.